DHL and RCG will work together to increase rail freight capacity and develop alternative routes to existing China-Europe connections, building on the routes of the Silk Road Economic Belt. The direct connection offers fast, efficient and sustainable multimodal capacity and is set bring immense benefits to both countries and continents, said member of the Board of Directors of Rail Cargo Group Thomas Kargl. From left to right: Erik Regter member of the Board RCG; Thomas Kowitzki, head of China Rail Mulitmodal Europe, DHL Global Forwarding; Thomas Kargl, member of the Board RCG; Christoph Wahl managing director Austria, DHL Global Forwarding; Clemens Först, spokesperson of the Board RCG. DHL’s existing trans-Asia network is 9,800 kilometres and connects Chengdu to Vienna in 15 days, running through China, Kazakhstan, Russia, Ukraine, Slovakia and Austria. To “further increase the efficiency in our network and thus ultimately for our customers, we are continuously working on expanding the railway connections,” said DHL Global Forwarding head of china rail and ocean freight Europe Felix Heger. 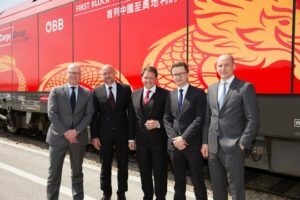 “DHL’s world-class forwarding services, tailored to a broad range of freight types and requirements, will draw out the best in our rail infrastructure connecting Austria to China and the world,” said Kargl. DHL Global Forwarding has also agreed to provide door-to-door services for every delivery. This includes trucking between Qingbaijiang and other parts of China, Vienna South Freight Centre and other European rail stations in its network, in addition to customers’ final delivery destinations.